Having a small garden or none at all, need not be a problem if you want to work DX as I have discovered. My QTH is a first floor flat in a converted Victorian detached house with little room and no permission to erect external HF aerials so my only option is the attic. The roof apex runs roughly north / south and the house is some 50 feet above sea leveland a km from the Solent. I had decided when licensed that I wanted to operate from 40 meters to 10 meters, specifically 40, 20, 17, 15 & 10 meters and after much research settled on the so-called Fan Dipole. 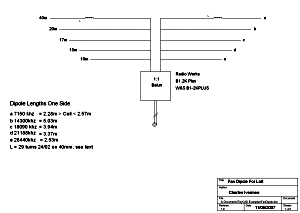 This antenna consists of one or more dipoles with a common coaxial feeder and a 1:1 balun choke to ensure that no RF travels down the outside of the co-ax screen. A single feeder can be used for a number of dipoles because each dipole has high impedance when not being driven at its resonant frequency. The combination of dipole and balun ensures that the antenna system is balanced which greatly reduces the likelihood of causing interference and does not need an RF earth. It really is not possible to get a good RF earth with a first floor shack as any wire to ground will most likely resonate or present high impedance to earth on one or more of the HF bands. At best it will be an unpredictable part of the antenna system, at worse will lead to RF all over the shack and a cause of interference, if not RF burns! (You do of course need the normal equipment electrical safety earth.) My attic is about 10 metres long, just short of the length needed for a 20 meter dipole so for that band around 250mm was bent down the rafter at each end before tuning. Obviously there is no room for a normal 40 metre dipole so I constructed loading coils on 40mm diameter PVC pipe. The 40 meter dipole runs along the apex of the roof, below that the 20 metre dipole is followed by the 17, 15 & 10 metre dipoles. I used 24/02mm PVC covered wiring cable for the coils and dipoles, why not buy a 100m drum and you will have cable left over for playing with portable dipoles, fishing pole verticals, etc. 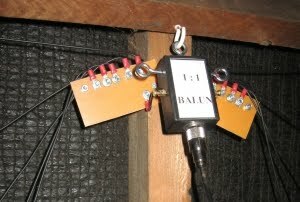 Initially I purchased a commercial balun but now use a home made co-ax and ferrite one. In order to terminate five dipoles I used two pieces of single sided PCB each drilled to accept six M4 bolts. Each wire making up the dipoles was crimped which made attaching to the bolts secure and simple. 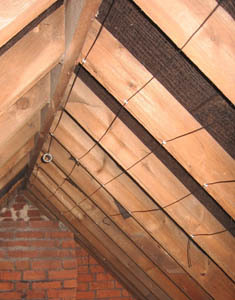 Horizontal spacing between each dipole is approximately 150mm and wires were attached to the rafters using plastic headed staples. The ends, after tuning, were secured with galvanised staples. If you intend to run more than around 10 watts I would suggest using standoff insulators, maybe the type used for electric fencing. Having said that I now run 70 watts SSB without any problems but I cannot advise you to do that! 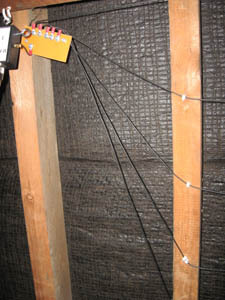 The dipoles were cut a few inches longer than the calculated length and after assembly, the antenna was tuned using an MFJ-259 Antenna Analyser connected to the balun by approximately 1.5 metres of coax. Starting from the lowest band each dipole was tuned for resonance and contrary to reports I found little interaction when tuning up the dipoles. Tuning consists on checking the resonant frequency which should be on the low side and then cutting an an inch or so off each end and re-checking for resonance. SWR was better than 1.5:1 on all bands except 40m and mostly below 1.3:1. On 40m the worse case SWR was 2:1.The automatic matching unit in my ICOM IC-703 was very happy with the antenna and indicated a SWR of 1:1 across 40, 20, 17 & 15, on 10m the SWR varied from 1.3:1 at 28.100 MHz to 1.1:1 at 28.800 MHz and 1.4:1 at 29.000 MHZ to 1.1:1 at 29.650. At 50 MHz the SWR was 1:1 from 50MHz to 51.6 MHz. The IC703 even gave a decent match on 80m something the auto matching unit in my TS480 absolutely refuses to do. So how good is this antenna? Well, given that I have been using it during the trough of the sunspot cycle I have to say that I am pleased with the antenna. In season I work all over Europe and North Africa on 6m, on 20m and up I have worked all over Europe, to Argentina, the Near East, Asian Russia, the west coast of America and into central Canada. Depending on conditions I can work all over the UK and Europe on 40m. Although not intended this antenna system puts out a good signal on 6m, it works OK on 12m and I have even used it on 2m SSB! OK that's not an objective appraisal of my system but I would recommend this antenna to anyone in a similar situation. There are losses compared to using a dipole in the clear and it is suggested that these are of the order of 6db or one S point. Losses will vary with the composition of the roof tiles and whether they are wet or not but it's a lot better than no HF aerial! Finally the most important factor when wishing to work DX , Is to be there! Detailed plans for download so that you can construct your very own Fan Dipole in the loft or anywhere you can fit one in. The lengths for each dipole are calculated in the normal way. 468 / The Frequency in MHZ = Total Length in Feet. Divide this figure by 2 to get the length of each leg. This Fantastic Article was Kindly Donated By Charlie M0WYM. Charlie is happy to answer any question you might have.